Today I put the finishing touches on this quilt for a friend’s almost 2-year old. I was so tickled to see that Quilting Treasures offered the print. Poky Puppy was one of my favorite stories as a child, back when it was one of the original 12 or 13 Little Golden Books. 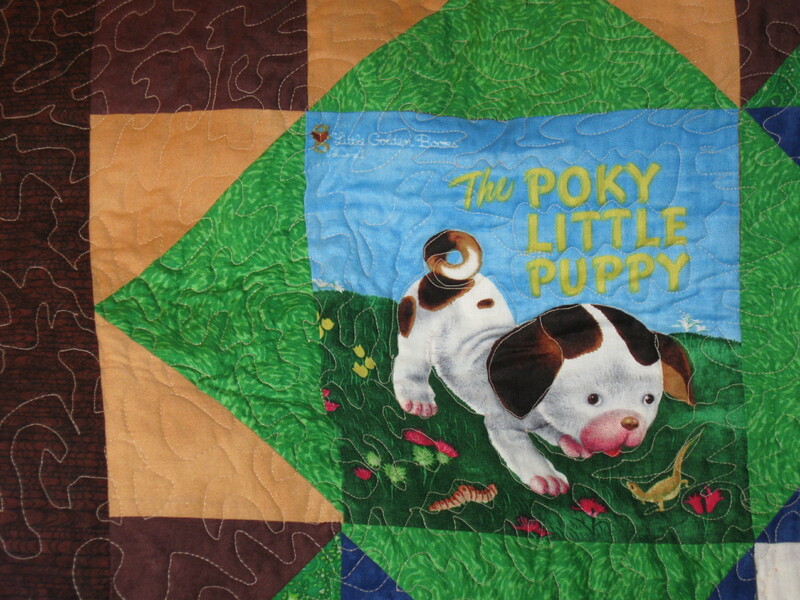 The panel that became the quilt top was meant to be a book. I also purchased the companion fabric. 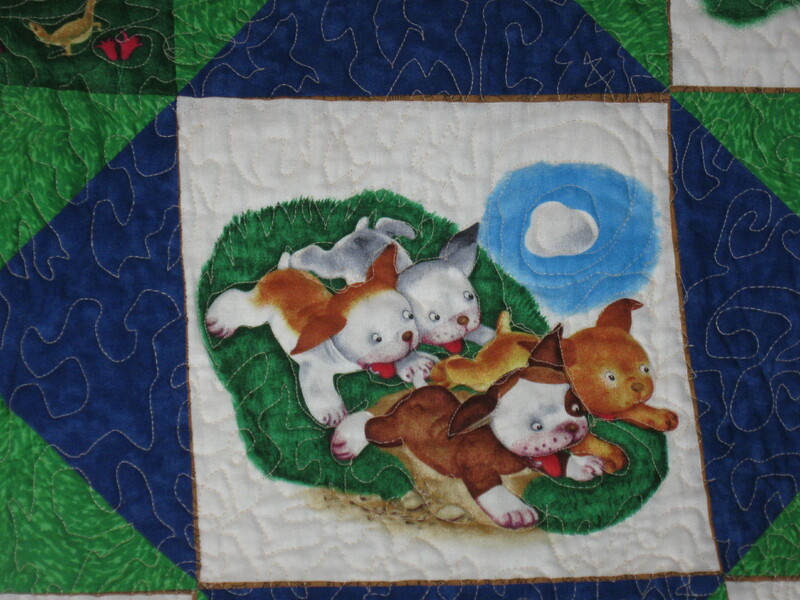 Plan A was to make the book and fussy cut the puppies from the companion fabric for the front. I am new to machine quilting but am enjoying the process. My first plan was to use blue since there was so much sky in the blocks. However, I realized that blue would look odd when stitched across a puppy face on the backing, so I used a light peach that blended everywhere except on the dark backing. I finished the quilting last week and the binding today. Delivery is tomorrow. 4/3/15 A story book used in a quilt instead of making a book isn’t quite a panel, but uses some of the same ideas, so I’ll like with Tuesday Archives (late). Button in side bar. He is sooo cute! 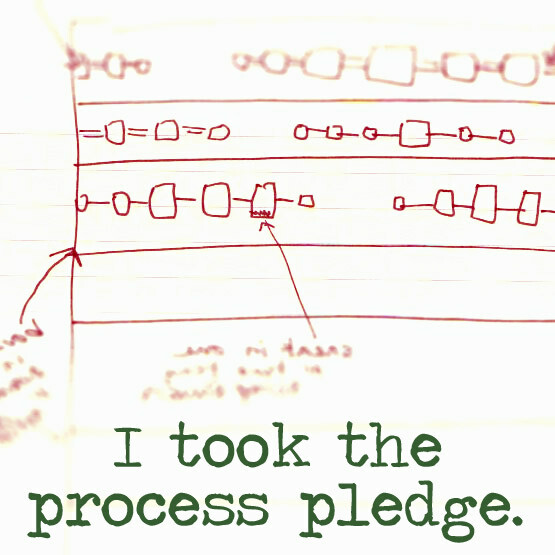 I’m glad you put it on. I read that to GKs. I loved that book too. 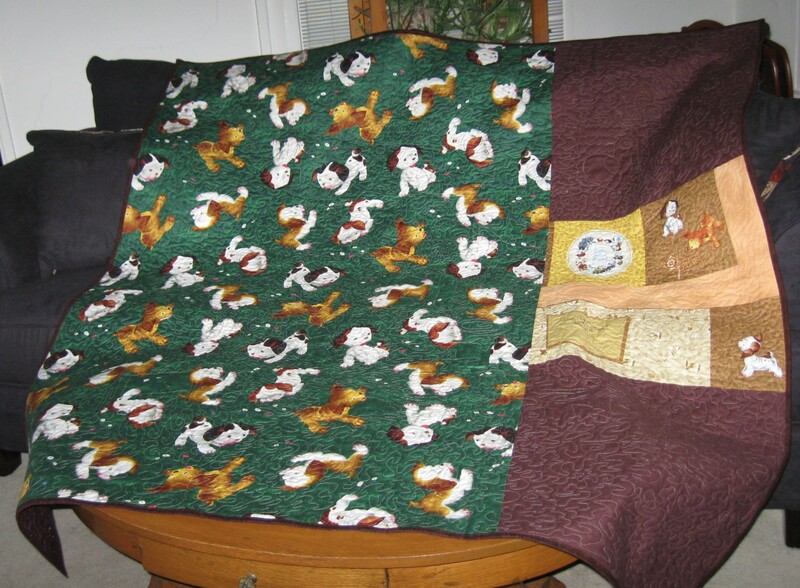 Very nice quilt and your quilting looks great. Claire, GOOD going gf! I am sure the child will absolutely adore it! 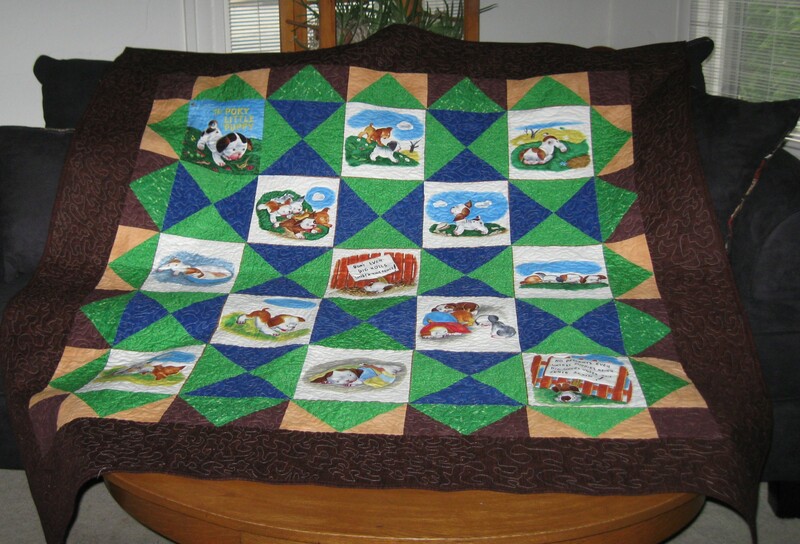 I love the quilt, and loved the book. Great use of the “book” fabric. It is gorgeous. I haven’t read the book but the pups are adorable. I love your idea for the back. You brought back happy memories of Little Golden Books! 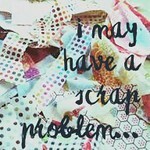 I think your quilt is adorable and any child would love to have all those adorable fabrics on their quilt. Thanks for rejuvinating the A D O R A B L E post under our Tuesday archives theme!! !